Dave and Patty Schwede invite you to visit our family seasonal campground in Wisconsin. Wildlife campground offers the true Wisconsin camping experience. Situated on 200 wooded acres, and open year round, our goal is to provide you with an enjoyable camping adventure. Located in Birnamwood, Wisconsin on Mayflower Lake, Wildlife Campground offers the finest amenities at reasonable prices. Enjoy fishing, swimming and snowmobiling. Sit around a campfire or simply enjoy the local wildlife. 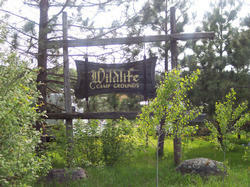 Wildlife Campground has something for everyone! Our location has not changed, but our address has. For GPS purposes, you may still need to use the below address. See events page for updated information regarding Soup Cook Off on October 15th!